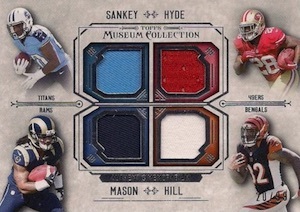 2014 Topps Museum Collection Football tackles the high-end of the hobby with an elegant spin. Every pack, or mini box, comes with a hit. Master boxes are highlighted by an autographed memorabilia card and a second autograph. Boxes come with just four packs, each with a different style of hit: a signed relic, an on-card autograph, a jumbo relic and a quad memorabilia card. 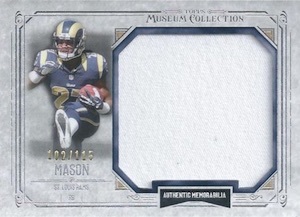 The 2014 Topps Museum Collection Football base set has just 100 cards. Top current stars, key rookies and some all-time greats make up the checklist. Parallels include Copper, Sapphire (#/99), Ruby (#/50) and Emerald (1/1). Autographed relics either have multiple swatches or a jumbo piece. Signature Swatches come numbered with both a jersey swatch and a patch. 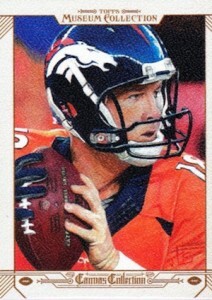 Rookie and veterans are part of the insert, that has more than 25 cards. Signature Swatch Triple Memorabilia follow a similar pattern with two jersey pieces and a patch. Both have Copper (#/50), Gold (#/25) and Emerald (1/1) parallels. Pro Bowl Signature Swatches take a similar approach but with pieces of Pro Bowl uniforms. Jumbo Patch Autographs focus on 2014 rookies. The numbered inserts have a large patch piece. Copper (#/15) and Gold (#/10) parallels are joined by Emerald Team Logo (1/1) cards. 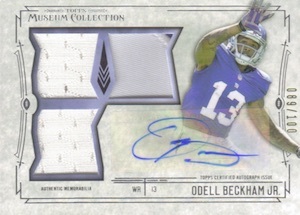 All basic autographs in 2014 Topps Museum Collection Football are signed directly on the card. The bulk of these are Signature Series cards, which has more than 40 rookies, veterans and retired players. In addition to numbered base versions, there are Copper (#/50), Gold (#/25), Gold Ink(#/5), Silver Ink (#/5) and Emerald (1/1) parallels. Dual Signature Series pair autographs from two players who share a connection. Museum Collection Framed Autographs return. On top of a distinct design, the cards come with a metal frame. These cards have three different versions: Silver Frame, Gold Frame and Black Frame (1/1). As you'd expect, Jumbo Relics showcase over-sized jersey swatches.Besides the basic versions and their parallels, collectors can find Pro Bowl cards and one-of-one cards with laundry tags, NFL Shields and Nike Swooshes. Dual Jumbo Relic Book Cards (#/5) have swatches from two players. Rookie Quad Relics and Pro Bowl Quad Relics all have three jersey pieces and a patch. Four-Player Quad Relics feature jersey pieces from four different players. Canvas Collection inserts return. Inserted one per box, they have painted images of top players done on a canvas-style card stock. Artist Originals have original artwork done directly on the card. New Artist Originals Autographs are signed by the featured player. 20 cards. 1 per box. 20 cards. Serial Numbered #/35. 45 cards. Serial Numbered #/115. 27 cards. Serial Numbered #/150 or less. 35 cards. Serial Numbered #/150. 25 cards. Serial Numbered #/99. 54cards. Serial Numbered #/350 or less. 30 cards. Serial Numbered #/200 or less. 25 cards. Serial Numbered #/200 or less. 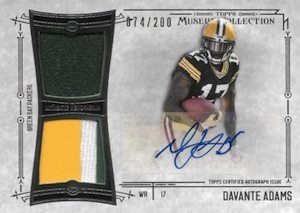 Im soooooo glad they finally brought Museum to Topps Football. 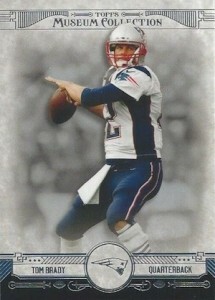 By far, hands down the best set topps has brought to us pure football collectors in a long time. I think Museum ’13 football blew 5 star out of the water. Keep up the good work topps. P.S. How about you bring back Tribute, that would definately be appericiated by your loyal collectors and you better do something with Panini getting ready to drop Flawless on us WOOO HOOO!! This is their second highest priced product and it’s pretty disappointing. Last year, the vets were nice but it’s maybe half the checklist of Five Star. This product does not have the same appeal as Baseball; the guaranteed hits are nice, but a majority of collectors (in Football at least) don’t care about jersey/relic cards. And a product with a majority of sticker autos are not welcoming in a near-$200 product. When will companies realize products don’t translate well between sports? Is there still no checklist for this product? Looking at this checklist I feel like the football version can’t hold value like the baseball set can. Too many rookies and the veterans they have are just OK for the most part with a couple of big names. The sooner that both Topps and Panini realize that some collectors don’t want rookie to be the focus of all the products the better. This product should be priced cheaper and the box will probably will go down after about a month. Matt >> Football requires a certain percentage of products to be rookies. Price will definitely drop. And I wish it would do as well as baseball, but since a majority of the product deals with rookies, there’s just not the same game-used content. I participated in a case break today and bought 3 teams, all before a checklist was available. I ended up with 6 hits, a 3-color patch PB auto of J. Charles #/25, RPAs of Logan Thomas and Aaron Murray #/200, an auto of Michael Floyd #/50, a PB jumbo relic #/50 of Eric Berry and another A.Murray auto #/350. I had Ravens as well. I only saw one card on the entire chklst for them. Some guy I never heard of in the Jumbo patch category. Not even any base for them. lol. No love. I like product better than last year. 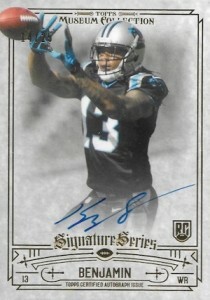 Bought a box and 2 hits were of Logan Thomas and one of the signatures cards had ink smeared on the back. Do they have any quality control? Glad to see Museum in football. Did well on my box. Cody Latimer auto triple relic,Jimmy Garappolo auto /75, quad relic Manziel,Bortles, Wilson, Tannehill, Marquise Lee jumbo and the cream of the crop a Peyton Manning Emerald Parallel 1/1. Good mix of rookies and vets. Way, way over priced for you get in a break. Checklist is also a very weak. Could have been a great product, Predict the bottom will fall out of the bottom for 2015 Museum. Pretty good. Did not buy a full box, but I did buy two hobby mini-boxes and one had a quad-relic of some big name linebackers #’d to 50. 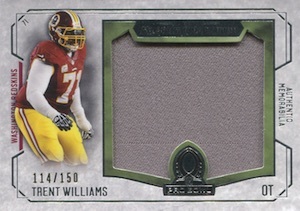 The other mini-box was the auto relic of Alfred Morris’ Pro Bowl jersey. Decent stuff, but like 90% of products; it is better to wait and pick up the hits, base, and rookies you want online after a month or so. Nice Canvas collection cards of Marshawn, Peyton and Brees. Joe Haden Pro Bowl Quad Relic 50/50! Emmitt Smith Gold Framed Gold Ink Auto 4/10!!!! I think like everything some luck is involved but these are pretty nice cards. 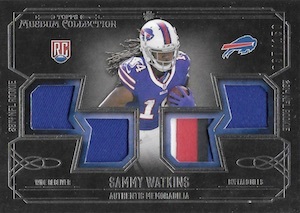 One pack … 1/1 Sammy Watkins NFL Shield. Money well spent. Also got a rookie /50. Strong product from early indications. Emerald (1/1) parallel of Odell Beckham Jr. Jumbo Patch (NY Giants logo) Auto!!! Okay, so it’s a redemption, but who cares? With the price at where it is now, I really like the product. Do you think there will be a 2015 release for museum football? 2014 Topps Museum Collection Factory Sealed FB Hobby Box Jimmy Garoppolo AUTO ? 2014 Topps Museum Collection Football Hobby Box - Factory Sealed!